Action Awareness is open January 1 – March 1. 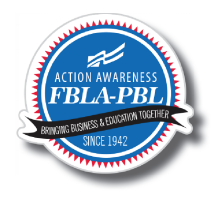 Chapters will be required to complete one task for each day of FBLA Week, one task for CTE month, and America Saves to promote awareness of FBLA-PBL programs. All chapters that complete Action Awareness will receive ribbons at the NLC. Participants will be recognized at the State Leadership Conference and will receive ribbons at the National Leadership Conference. Entries must be submitted online at http://go.fbla.org/action when the program is open.